Poet's Jasmine, one of the five fragrances that make up Ineke's Floral Curiosities collection is one of the synonyms for Jasminum officinale - the mainstay household jasmine that has been naturalized throughout Europe through historical routes little known. Poet's Jasmine opens with a very tame, fruity and light jasmine accord, and hints of tea accents. The fruity body takes over within a few minutes, revealing a summery composition that reminds me first of the candied-flower fragrance of methyl-antrhanilate that is prevalent in Serge Lutens' Fleur d'Oranger; and quickly developed into the amber, ylang ylang and jasmine accord of Annick Goutal's Songes. This phase remains on the skin for an hour or so; and then turns into a skin musk type of scent, the like of the musc and patchouli base that's Crazylubellule and the Poppies' ShanghaiJava Musc & Patchouli. If you dislike the indolic aspect of jasmine, this would be a nice jasminesque scent for you. I also noticed a huge difference between wearing it in cool weather vs the warm weather we're blasted with right now. In the cooler weather it smells more watered-down and distant. I'm happy to report it is much better in the heat, taking on more floriental and dreamy personality. 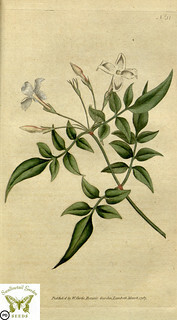 Place the poet's jasmine flowers and foliage in a teapot, add the boiling water and allow to infuse for about four minutes. Remove the jasmine with a strainer, add a slice of orange instead of lemon, and a little honey for added sweetness if you like. Serve with a sprig of jasmine flowers and a few bon mots."